Rationalist Judaism: "You Must Love People! 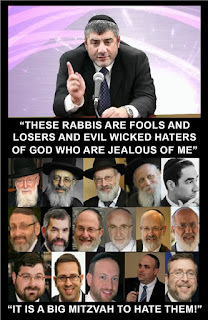 Except Rabbis who are Fools and Losers and Reshaim!" "You Must Love People! Except Rabbis who are Fools and Losers and Reshaim!" I've got some posts of major significance coming up, but before that, here's some light entertainment. Rabbi Yosef Mizrachi spoke in Ramat Beit Shemesh earlier this week, in a lengthy lecture which covered two topics at great length, albeit with a dearth of actual substance. His second longest discussion was about the consequences and precise nature of immodest clothing that some women wear (he seems a little obsessed with that), and he made numerous jokes about such women, to the appreciative guffaws of the audience. But he also spoke about how important it is to love people, and not to hate Jews who are different, or "miserable chilonim," and not to "murder people online." A large portion of that discussion, however, revolved around a lengthy important qualification (see at 29:55), that with some people, it's a mitzva to hate them! "One rasha that lives here in town had something to say." Being called a rasha by Mizrachi puts me in very fine company - he readily uses that title for all the respected rabbanim that criticize his approach. What an honor! "He wrote against me: How did they let me come and speak here?!" Actually, I never wrote that, and in a private discussion group, I recommended against protesting his lecture. What I actually wrote was a precise critique of his statements, which, unsurprisingly, he did not address. "He forgot to say that all the rabbis in the world put him in cherem!" Actually, it wasn't all the rabbis in the world, just the charedi ones. And they didn't put me in cherem, just some of my books. And I didn't forget to mention it at all; in my first post about Rabbi Mizrachi I explicitly discussed that and contrasted it with the letter against him. "He forgot to say that he's an apikores who makes fun of Chazal!" Actually, I've always been very open about my views on Chazal, which do not involve making fun of them and are not apikorses, unless you classify saying that Chazal lacked certain knowledge about the natural world is making fun of them and is apikorsus. In which case Rabbi Mizrachi is accusing Rambam and many others of apikorsus. Rabbi Mizrachi followed this by by adding me to the other rabbis as being among "the greatest enemies of the Jewish nation" and as someone that it is a "very big mitzvah to hate." Not just any old mitzvah - it's a Very Big Mitzvah! It's almost as though Rabbi Mizrachi himself has the exact same flaw that he accuses his numerous rabbinic opponents of possessing - a fragile ego. Incidentally, I just noticed that my third post about Rabbi Mizrachi, "The Biggest Enemy of the Jewish Nation," is now my sixth most-read blog post of all time, with over ten thousand hits! I wonder how many of those were from Rabbi Mizrachi? Oy, the Arizal said that Rabbi Yosef Mizrachi is doing a Very Big Sin! Maybe Hashem is punishing him by having him criticized by rabbis with beards? To save people some time here is the section about you. I have not heard him until now thanks to your link. If to leave aside personal attack against his critic, the lecture was pretty meaningful. Don't see why he had to be criticized to start with. Now I understand all of your recent posts: you were baiting him into attacking you. It was worth it for the humor value alone :). What concerns me the most is that this fundamentalist has an audience. Why do you think people are unwilling to stand up to him and his 'mesorah'? Does no one even query his assertions in his presence? If saying about it is the main topic of the posts, if it's said in a humorous form accompanied by humorous images (like flying elephants), then it is. The statement made about jumping elements was a conjecture of Tosafos and not a statement of Chazal. The video is humorous but is not making fun of Tosafos, although it could be construed to be making fun of those who think that Tosafos conjecture must be factual, even though we can see with our own eyes that elephants can't actually jump. In fairness, up until very recently it was impossible to get a good shave without a razor. (Still is, to be honest.) There's a bust in Rome that's supposedly of Josephus. One thing that stands out is that while every other Roman bust is either clean shaven or fully bearded, this one has a tiny bit of stubble and peyot. Remember that this isn't a photo- a sculptor can do what he wants and had to go out of his way to make that. As a great man once said "behind every beard, is a smooth shaven cheek"
Tbh, his shave is not that great. I don't think the Ari meant such a sloppy job. Proud of you! Sad for us. i actually tortured myself and watched most of it. It's beyond crazy. He starts by preaching against those who hate other Jews who have different views, saying among other things that they have no share in olum haba and then proceeds to rip into other Rabbis in the harshest terms, calling then evil and reshaim. If there ever was a greater example of כל הפוסל במומו פוסל, I am unaware of it! "You Must Love People! 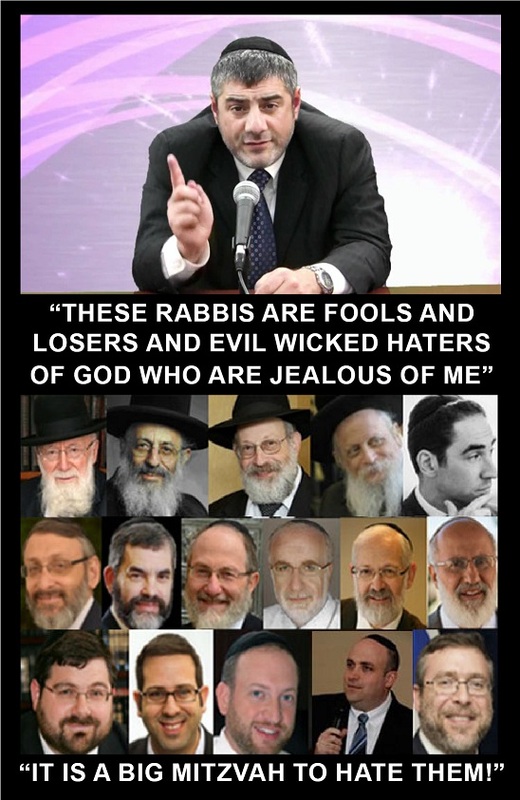 Except Rabbis who are Fools and Losers and Evil!" Sounds almost exactly the same as "We have to respect diversity and tolerate others, except deplorable people, losers in flyover country who are evil." The modesty portion of his speech is so problematic its to the point of being ridiculous and juvenile, he sounds like my 9th grade Rebbe. Regardless of your position on modesty (I think its ridiculous completely arbitrary and made up); the halacha is outdated as the laws were established in a time when people never left the shtetil and the only woman you would ever see are ones living in your little shtetil so it makes sense to adjudicate their behavior. Today living in a large city on the side of the bus you can see more immodest than any religious woman could possible wear, Chotah Machtah is ridiculous. At least they're all consistent in their stupidity. Of course your public fight is popular reading - everyone likes to watch a fight and enjoys the insults that are thrown around and the snappy responses. That's why boxing and cockfights draw crowds - but it doesn't make it the Jewish thing to do. You rightfully made your public condemnation. Now isn't it the time to ignore this ignoramus and not even credit him by any further responses to any further provocations? Let's get back to what made your blog unique. i'm just curious about your love affair with the centrist/rationalist world you embraced when chareidim shunned u. are your children's friends in school exposing them to TV and movies? how is the dikduk hamitzvos in your new world? do your sons have girl friends in bnei akiva? The story that he tells over from this anonymous person "very close" to the Lubavitcher, is pure rubbish. The Lubavitcher sent out emissaries from the 1950s with the same message until he died, one of love and acceptance. He never preached hell. He can shave it. We cannot! Mizrachi is just gross. Now he's claiming, hinting that the Lubavitcher Rebbe prophesied that Mizrachi would be a speaker with the harsh style that he has, and that people would be against him, and that everyone should do whatever they can to protect him? Get a grip. My wife and I have serious fights in the car because she wants to play her Rabbi Mizrachi cds and I want to yank them and throw them out the window. He is perfect example of how halacha and hashkofo are being skewed beyond all recognition. Just an example of how this issue even divides families. My two cents: his putting down of rabbanim and other comments are unacceptable. Thats all for that. Secondly, every arrogant, I know best post and comment online strengthens the legitimate feeling of many Orthodox of us against them. We aren't living amongst the sages. The fact that most rabbanim or institutions are varying levels of flawed is not a chiddush. What is true is that the Torah is true and Gd is true and if one doesn't believe then why are they wasting their time discussing the Jewish community on blogs. Therefore a normal Orthodox joe will see a strong worded person on his side that is of course flawed, and a high fluten gasbag who has signed on to the timeless tradition of feeling they know what's wrong and the populace is so shortsighted and archaic. Many posts by Rabbi Slifkin and comments are not that. They are honest thoughts on yoddishkeit. However so much of these discussions are contradictory. Trying to enlighten a community that is rightfully ticked off at the enlighteners arrogance. Important point to note for those trying to bring positive change to the Torah community. Again not saying the standard Slifkin article is this.